The tile roofing material cost from $700 to $800 per square with the installation for the Houston, TX area. The price material is between $400 and $1,000 per square. This material comes in clay or concrete and can be shaped in many different ways. The clay material won’t changes the color with age, but the concrete can become darker with time. Terracotta is the only concrete material that can maintain the base color. Average cost: $2.00 to $4.00 per square foot. Average cost: $2.25 to $4.80 per square foot. Average cost: $2.29 to $2.49 per square foot. Average cost: $2.50 per square foot. Average cost: $3.00 to $6.50 per square foot. Average cost: $3.20 to $3.90 per square foot. Average cost: $3.00 to $5.00 per square foot. Installation requires a lot of special equipment and tool and a lot of working time. Also, the installation requires to hire a contractor, and we are at your service. It usually costs around $100 to $150 per square. Some roofing systems can be installed over older roofs, the price is from $115 to $165 and for three layers approximately $125 to $175. It usually costs around $2.15 to $2.86 per square foot depending on the needs and goes from around $6,000. Average price is from $1,000 to $10,000, depending on the extra support if needed. It can run from $600 to $1,000. It can cost from $20-$40 per gallon. The roofing systems with this kind of material are hard wearing, rigid and heavy and are good for the high wind areas. The advantages of this material are the fire resistance and have a great durability. They can last over 50 years and more. The expected lifespan is about as long as the building on which is installed the tile roofing. They may be heavy but the replacement is very easy. That is why this material is very popular and interesting for the homeowners in Houston area. Do not hesitate, contact us. We will make you a quote and choose the best materials you roofing system needs. For all the help any questions about the tile roofing, contact us today. 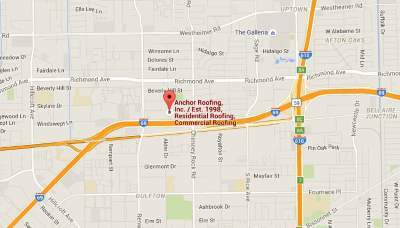 Anchor Roofing will be there for you, your home and your roof. Our contractors install, replace, and repair the tile roofing systems in the Houston, TX area, including Katy, Sugarland, Missouri, Pearland, Spring, Cypress, Galena Park, Richmond, Rosenberg, Stafford, The Woodlands, Baytown, Clear Lake, Galveston, La Marque, Pasadena, Deer Park, Sealy, La Porte, Brookshire, and Columbus.